Lawrence Milton Cripps, 79, of Nevada, passed away Saturday, March 30, 2019, at Nevada Regional Medical Center following a life dedicated to the faithful service of mankind. Lawrence was born Jan. 3, 1940, in Milford, Mo., the son of Herman Ellsworth and Audrey Lavina (Cramer) Cripps. He graduated from Bronaugh High School in 1957 and Lawrence joined the United States Navy after High School and served for four years. 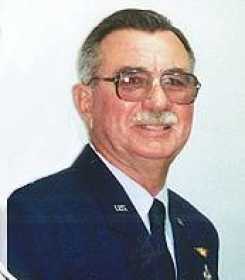 He later joined the Air Force Reserves and retired, Chief Master Sergeant, Air Force Reserves. Lawrence worked for the Nevada Police Department in 1963 before working for the Missouri State Highway Patrol as a license examiner (retiring after thirty years of service). Lawrence also pastored the Methodist Churches at Horton and Metz. Lawrence married Mary Martha Duncan on May 28, 1962, and she preceded him in death on Jan. 31, 1993. He later married Regina Ann Burnham Feb. 19, 1994, and she survives of the home. Lawrence was a 50-year member and Past Master of Masonic Osage Lodge No. 303, Past 45th District Deputy Grand Master, member of the Mirza Shrine in Pittsburg, Kan., Scottish Rite 33rd Degree, York Rite, the Eastern Star, and Worthy Patron of the Eastern Star. Lawrence was the Nevada Representative for the Masonic Retirement Home of Missouri. Lawrence has for many years conducted Masonic Services for fellow Masons at their funeral services. Lawrence received an associate degree from Wentworth Academy in electrical and hydraulics, held a private pilot license, and played the piano at community functions and Eastern Star meetings. He volunteered at the Vernon County Election Board, drove cancer patients and veterans to their out of town doctor’s appointments, and could always be identified driving a two tone brown Ford truck in Nevada, always on the go, always on the way to help someone with need. Lawrence was preceded in death by his parents; first wife, Martha; and son, Wayne Milton Cripps. He is survived by his wife, Gina, of the home; son, John Ellsworth Cripps and wife, Melinda, of Kearney, Mo. ; stepson, Donovan Bankhead and wife, Belinda, of Springfield; stepdaughter, Shannon Close and husband, Charles, of Houston, Texas; brother, Ray Cripps and wife, Karen, of Ponca City, Okla.; sister, Vera Ellison and husband, Floyd, of Joplin, Mo. ; niece, Kathy Gossen; nephews, Lonnie Cripps and Rodney Cripps; extended family and special friends which include, George Leemasters, David Grubb, Vic Hines, and Paul Daniels, just to name a few. Funeral services will be held at 1 p.m., today, in the United Methodist Church in Nevada with Bob Beaver officiating. Interment with Military Honors will follow in the Moore Cemetery. Visitation was held from 5 to 6:30 p.m., Tuesday, April 2, with a Masonic Service and Eastern Star Service following at 6:30 p.m.